The Victorinox Swiss Army Classic SD Pocket Knife is extremely versatile for it's size and weight. It attaches to your keychain and provides six tools easily in reach. You can tell this knife is engineered well and stood the test of time with the reputation that comes along with it's name. While some components of the knife may not be the strongest- they were designed that way to provide improved functionality, lighter weight, and they tack a lifetime warranty on it. All of the tools are easy to maintain, and there are replacement tools widely available if you happen to lose the toothpick (everyone does it at least once!). 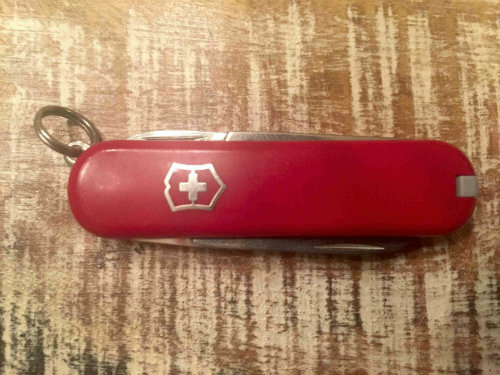 There are several springs and wearable parts on the Swiss Army Knife keychain. While not necessarily an engineering problem, these are the failure points of the knife under normal use. Expect the toothpick catch that holds the toothpick in place in the case to wear down eventually, likely causing the toothpick to fall out and become lost. The tweezers are held in place by them being compressed into the housing, so the tweezers will eventually lose grip in it's storage spot too after plenty of use. The scissor spring can pop out from under the top arm of the scissors, allowing the fragile spring to get caught on something. The brass pins seem to hold up very well during use. Victorinox actually sells Multi Tool Oil, but mineral oil works well too. The blade does not need to be oiled since it is stainless steel and not carbon steel. 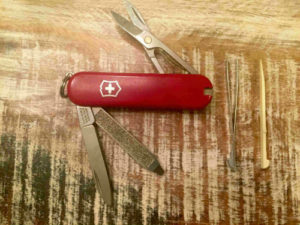 SG: I did not add the swiss army knife keychain to my EDC kit until my wife bought me one for Christmas two years ago. I was a caught by surprise from the gift, as I had not asked for it or hinted that I wanted it. To tell the truth, I found it a little small and disappointing. I put it on my keychain as a gesture of goodwill to my wife- you have to use a gift, especially if it is from your wife. Since then I have used the swiss army knife daily, if not more. The toothpick, which seems whimsical, actually comes in handy often. I pulled a splinter out of my finger just the other day with the tweezers, and use the scissors pretty often at my workplace. 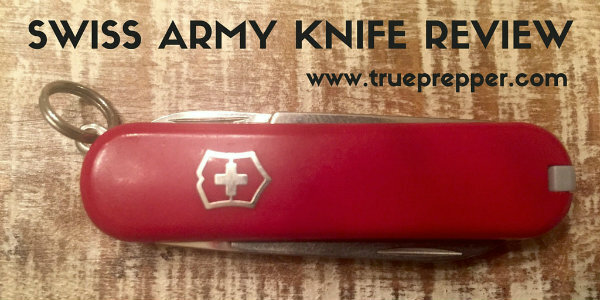 The least used tools on the swiss army knife are the file, screwdriver, and the actual knife. I carry a Gerber Shard also, which will take more torque on the screwdriver tip, and an SOG Twitch as a knife. I don't ever bother filing my nails- even at home, so that would not get used regardless. Overall, I am pretty pleased with it and it is pretty neat that it has a lifetime warranty- not many things do these days. I guess my wife knew what she was doing when she got me a swiss army knife keychain for Christmas! The Victorinox Swiss Army Classic SD Pocket Knife would be a great starter tool or addition for your Every Day Carry kit. It is very versatile, and well worth it's price tag in usefulness. We recommend it here at TruePrepper, and we all enjoy ours.